Maybe the best way to set your first steps on the 630 m band is by listening. Most transceivers have a general coverage receiver that will go down to 472 kHz. For receiving a tuned (resonant) antenna is not a must. Most HF-antennas (in particular lower band antennas) can be used. The received signals will probably be weaker compared to a dedicated 630 m antenna, but as long as they are above the noise floor this is not an issue. An active antenna, such as the PA0RDT mini-whip ©, can also be considered. Probably the best way to check your RX-station is WSPR. Most evenings there is plenty of WSPR activity on the band. By comparing the reports (SNR) you can evaluate how decent your setup is. Once that is done you can try to copy stations in CW or one of the weak signal modes used on 630 m, see popular modes for more info. Due to the very strong broadcast stations on LF and MF, intermodulation interference is often a problem, sometimes even with moderate antennas. The easiest way to reduce this interference is to put an attenuator between the antenna and the receiver. The more the antenna signal is attenuated the more the intermodulation products will be reduced. But also the wanted (630 m band) signals will be attenuated, and we don't want these to drop below the receiver noise floor. The optimum value of the attenuator is reached when the external noise floor (QRM, QRN) is just above the receiver noise floor. Or otherwise said: you should hear a clear increase in noise when connecting the antenna. As on MF there are large variations in signal strength and QRM/QRN between day and night an adjustable (step) attenuator might be considered. Transmitting on 630 m is a bit more complicated. First of all you will need a tuned antenna. Next you will need a 472 kHz transmitter. 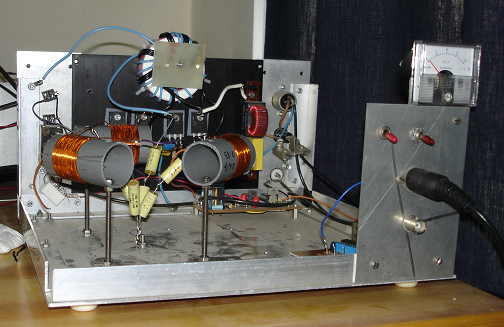 A commercial HF transceiver that transmits on 630 m, eventually in combination with a power amplifier. A homebrew transmitter. This is maybe the simplest option it you are happy to stick to CW and eventually Opera. A homebrew transverter. This is a bit more complicated than a transmitter, but will allow all modes used on 630 m.
A homebrew upconvertor. With an upconverter the audiosignal is directly converted to the desired RF frequency. The SoftRock RXTX is sold as a low cost kit. So if you are reluctant of modifying an expensive rig this may be the way to get started on 630 m in CW and digital modes. Just a final word about power amplifiers on 630 m. While on HF we are used to linear power amplifiers, most popular modes on 630 m (CW, QRSS, DFCW, JT9-1, WSQ, WSPR, Opera) don't require linear amplification. For that reason most designs are based on class D or class E amplifiers that have an efficiency of 80% or more. These amplifiers can be built with rugged and low cost power MOSFET's. TVTR1 630m Transverter: the Monitor Sensors 630 m Transverter enables any amateur radio station, equipped with a conventional HF transceiver, immediate, all mode, access to the 472-479 kHz band. Output power is 50 W. Designed by VK4YB. JUMA TX500: a digitally controlled CW transmitter for the 500 kHz / 472 kHz amateur radio band (range 450-550 kHz in 10 Hz steps). The transmitter is available as a component kit which includes all the electrical and mechanical components. Output power is 60 W. Designed by OH7SV. At least for transmitting a dedicated (tuned) antenna is required. Due to the wavelength most antenna's used on 630 m are small (compared to the wavelength) and thus have a rather low radiation resistance. The most popular transmitting antenna is some kind of toploaded vertical monopole. This may sound complicated, but it is a rather simple antenna. In fact it is just a fancy name for a horizontal wire with somewhere a vertical dropdown wire attached. It can even be as simple as a 80 m or 160 m dipole where the feeding line acts as dropdown wire (just connect both sides of the feeding line together at the lower end). A small vertical monopole has a rather small radiation resistance, often in the range of 0.1 to 1 Ω, and the antenna impedance has a capacitive component that has to be cancelled out by a series inductance (loading coil). An alternative for a toploaded vertical monopole is a loop antenna. Here also the rule "the bigger the better" is applicable. If the loop antenna is small compared to the wavelength (what is very likely on 630 m) the radiation resistance will be very small, even much less than for a toploaded vertical monopole of the same dimensions. The antenna impedance will have an inductive component that has to be cancelled out with a series capacitor. Note that the current through the loop antenna, and thus through these capacitors, will be large. So you will need very decent caps. Bring the antenna to resonance (cancel out the reactive component in the antenna impedance). For a vertical monopole this is done with the loading coil, for a loop antenna with the series capacitor. Match the impedance of the resonated antenna to the transmitter impedance (often 50 Ω). Although this can be done by tapping the loading coil (or the series capacitor) it is often more convenient to use a matching transformer or eventually a LC-network. A matched (resonant) antenna has a total resistance is composed of the radiation resistance and the loss resistance. For small antennas the radiation resistance will be much less than the loss resistance, so only a small part of the power applied to the antenna will be radiated. Depending on the type and dimensions of the antenna and the surrounding you might need 10 to 100 W TX power (sometimes even more) in order to radiate 1 W!